Running is a great way to get outside and exercise. The activity also requires a lot of training if you want to start running marathons and races. Peter Sagal, host of NPR’s WAIT WAIT…DON’T TELL ME! 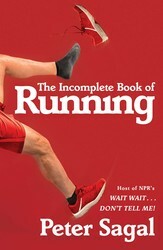 and author of THE INCOMPLETE BOOK OF RUNNING, shares why if he can become a runner, anyone can become a runner. As my own amateur athletic career shows, just about anyone (barring chronic illness or injury) can become a successful runner. I am devoid of natural gifts – I am short, thick through the middle, as aerodynamic as a boulder, and have the attention span of a toddler. Yet I have completed 14 marathons, including 2 Boston Marathons as a qualifier, and have won various age group medals in shorter local races. If I can do it, you can too. Hi-tech clothing, including anything made from Dri-FIT, Drilayer, GEL-Cool or any other fabric with a “™” next to its name. Compression socks, shoes with springs or convex soles or any other gimmick. A running watch, a Fitbit, or cool expensive sports sunglasses. Arm warmers (what is the deal with those arm-warmers?). A subscription to Runner’s World, or any other specialized magazine. A running track, or running path, a treadmill, a gym membership, a phone, a phone app, a GPS device, music, podcasts, headphones, and helpful books of advice, including (sigh) my own. A pair of running shoes, preferably but not necessarily made by an established athletic shoe brand, shorts, shirt, a sports bra if you’re a woman, some layers and a hat if it’s cold out, and a kitchen. Expectations that you will lose a lot of weight or look anything at all like the people depicted on the cover of Runner’s World or Shape or Men’s Fitness. Unrealistic goals such as completing a marathon two months after you start running for the first time. Self-criticism, self-doubt, and that nagging feeling that you were not born a runner. The knowledge that you were born to be a runner, because you are a human, and we humans were, as someone once said, born to run. Our fur-less skin, our upright gait, our immense lungs, the efficient cooling system known as “sweat,” are all evidence that our species evolved to run, and to run far. Its how we escaped predators and caught prey. It’s how we spread from Africa to Tierra Del Fuego, the long way. When running becomes not so much a hated chore but a way of life, as it has for me, you start to become what you were always meant to be. You will not end up looking like a model, or a track star, or a marathon winner, unless you are those things. You will end up being more honestly and clearly the self that you were meant to be: thinner, fitter, faster, and more at home in the world than you feel now. Running is a sport, of course, with its competitions, rewards and medals, training tips and personal goals. I am all for those, having run countless races. I treasure my souvenir shirts and participation medals, and the two or three little trophies I actually won by coming in near the front. Pursuing those medals and finish lines is a wonderful motivator to get you out of bed at an early hour and get you through the hardest miles, and I recommend them to anyone, even somebody who’s been indolent until now. Sign up for a race, short enough to be attainable (a 5K race, or 3.1 miles, is always a great first choice) and far enough in the future (3-4 months) to be attainable with the requisite effort. But even though running is a sport, do not fall victim to the mercantile conspiracy to make you believe that success can only be achieved with a certain logo on your chest or piece of technology on your wrist. Do not believe that a runner must dress, speak, or act a certain way: we have been running for millennia, wearing animal furs or nothing at all and speaking languages now long dead. Phidippides, who created the marathon by running from the battlefield of Marathon to ancient Athens to deliver the news of victory, was not wearing Nikes. This is not to say, “Just do it,” as somebody also once said. It is difficult to become a runner, after a life indulging in the conveniences of the modern age. You will have to work to rid yourself of both excess flesh and unhealthy habits. You should start buying and eating better and healthier food, which you should prepare yourself from basic ingredients whenever possible, and that is far less convenient than grabbing something off a rack and tearing off the wrapping. You will have to keep going (sometimes) even though you are not happy and not enjoying yourself, which is contrary to the presiding spirit of our age: delight and happiness at every moment. You will have to be disciplined in a time of a thousand distractions. You will have to be persistent when everything around you continues to change. But you have almost everything you need, right now. Get some good shoes. Put on shorts and a top. Step outside. Pick a direction. Go. For more advice on how to start running check out THE INCOMPLETE BOOK OF RUNNING by Peter Sagal! Peter Sagal, the host of NPR’s Wait Wait...Don’t Tell Me! 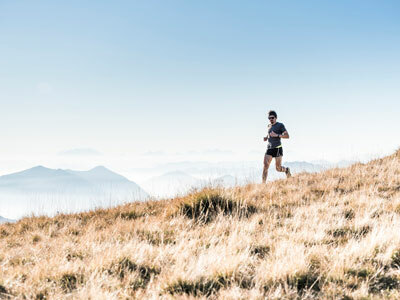 and a popular columnist for Runner’s World, shares lessons, stories, advice, and warnings gleaned from running the equivalent of once around the earth.At the verge of turning forty, Peter Sagal—brainiac Harvard grad, short bald Jew with a disposition towards heft, and a sedentary star of public radio—started running seriously. And much to his own surprise, he kept going, faster and further, running fourteen marathons and logging tens of thousands of miles on roads, sidewalks, paths, and trails all over the United States and the world, including the 2013 Boston Marathon, where he crossed the finish line moments before the bombings. With humor and humanity, Sagal also writes about the emotional experience of running, body image, the similarities between endurance sports and sadomasochism, the legacy of running as passed down from parent to child, and the odd but extraordinary bonds created between strangers and friends. The result is a funny, wise, and powerful meditation about running and life that will appeal to readers everywhere.